FROSTBURG, Dec. 14 – A fire, doing an estimated damage of $150,000, broke out this morning about 5 o’clock from the Shea building, this place, and before it was extinguished burned seven buildings to the ground. The destroyed buildings were: Shea building and a double block residence and average on same lot; the building occupied as store and residence by the Frostburg Furniture Co. and a warehouse and stable on the same lot; a building owned by Mrs. D. J. Betz and occupied on the ground floor by Jeffries Bros., jewelers; Zeller’s barber shop and C. F. Betz’s grocery store; a garage and storehouse on First street owned by the Frostburg Furniture and Undertaking Co. Fanned by a stiff gale the fire burned furiously for four hours and it was not until 9 a.m. that it was under complete control. For some time it looked as if the Lyric building would also burn, and all its occupants moved their furniture and fixtures to places of safety. The Lyric Theatre suffered considerable damage from the blazes which leaped across from the Betz building, all the east windows being broken and the sash and frames burned. The occupants of the Shea building lost everything, as the fire was so far advanced when discovered that nothing could be saved. The building was occupied on the first floor by the Shea’s drug store and McCrorey’s five and ten cent store, on the second floor by offices of Clayton Purnell, attorney; Frostburg Building and Loan Association; Thomas Elias’ tailor shop and offices of Parker-George’s Creek Coal Co., the Gleason Coal and Coke Co. and Sullivan Bros. Coal Co; the third floor of the building was occupied by the local aerie Fraternal Order of Eagles. The Frostburg Furniture and Undertaking Co. lost their entire stock and almost all the household furniture of Jonas J. Durst, president of the company, who with his family, resided on the second floor. All that this concern was able to save out of an estate valued at $30,000 was two horses, a motor ambulance, a National touring car, two hearses and some embalming instruments. C. F. Betz, grocer, lost almost his entire stock, while the entire stock of the Jeffries Bros., jeweler’s was saved. G. W. M. Zeller lost heavily although some of his barber chairs and fixtures were saved. Nearly all the household furniture of Robert Cook and James Durst, who occupied apartments on the second floor of the Betz building was saved. The second floor of the Beatz building was occupied by the offices of the City Clerk J. S. Metzger, Attorney Charles G. Watson and City Engineer William Harvey. City Clerk Metzger saved all the town’s records and the most valuable of his own papers. William Harvey saved most of his equipment and papers. Attorney Watson lost practically everything. Some damage by water was done to the Lyric café and the Hosken and Gunter’s pool room. These two concessions moved all their stock and some of their furnishings when the fire appeared most threatening. The second floor of the Lyric building, which is occupied as a residence by Mrs. L.R. Ash and J. C. Youngerman, was emptied, the goods being carried to the houses of friends and stores on the opposite side of the street. The furnishings of the third floor of the Lyric building, occupied by the local draft board, were also carried to places of safety, and scores of men worked untiringly carrying out the immense stock of goods Stanton’s hardware store. Most of these goods were packed in the Catholic church yard. 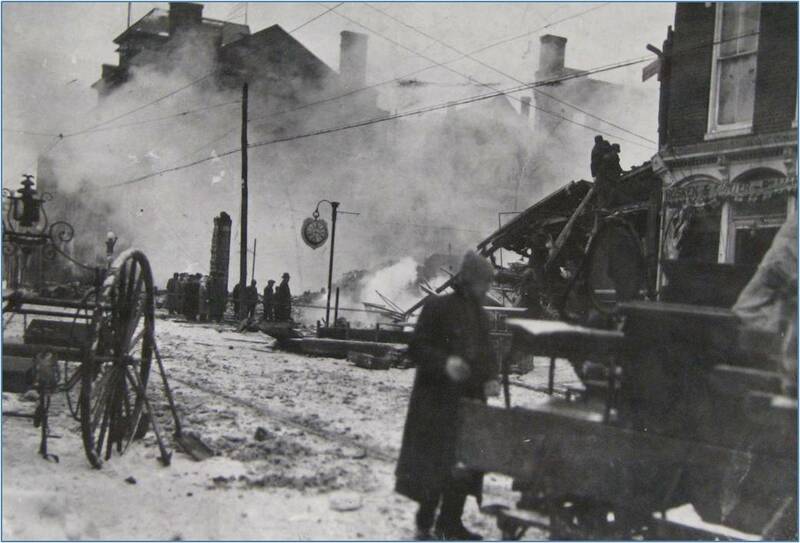 Mrs. Truman Thorpe and Mrs. Isabel Campbell occupied the burned double block house in the rear of the Shea building. The Thorpe family saved much of their household goods; Mrs. Campbell saved nothing but a watch, which belonged to her deceased husband. The Gladstone Hotel was in great danger for a long while, but owing to the direction of the wind and persistent efforts of the firemen the damage to this building was slight. The residence of Wm. J. Daily and a house owned by Mrs. John Brady were in great danger for a while and so much fear was entertained for their safety that all the contents were removed to neighboring houses. This was the most extensive and damaging fire experienced in Frostburg since 1874 and had it not been for help from Cumberland, Lonaconing and Midland the disaster would have been probably the worst in the history of the town. Between 75 and 100 men of Good Will Fire Company, Lonaconing, arrived at 7 o’clock with much needed equipment and they worked heroically with the Frostburg Fire Department until the blaze was under control. The new motor truck of the Cumberland Fire Department arrived on scene at 8 o’clock and the strong stream this engine produced, after being attached to the fire plug in front of St. Michael’s Church, was all that prevented the fire from eating its way down Welsh street and First street. The Midland firemen were also on the scene and worked hard until all anger had passed. Had it not been for a combination of adverse circumstances the Frostburg Fire Department could undoubtedly have kept the fire confined to the Shea building. The men never worked harder, but they had to work without the new motor truck – their best piece of equipment, which was in Cumberland undergoing repairs. Another handicap resulted from the recent gas failure, which caused a freezing temperature in the hose house and the hose, used only a few days ago at another fire, were found to be frozen when put in use this morning. It was not long this morning after the fire bell rang until four of the hoses were connected to as many water plugs, but when the pressure was turned in, three of the lines burst, causing a loss of time for repairs. Add to this, annoyance of a high wind and for some reason an unusually low water pressure and one can easily understand that it required almost superhuman effort on the part of the men of the fire departments to save from destruction a larger area than is now laid in waste. Owing to the holiday season, all stores were heavily stocked and consequently the loss is greater than it would have been at any other season of the year. Mr. Shea alone places loss at $60,000, while that of the Frostburg Furniture Co. is estimated at between $30,000 and $35,000. These two are the heaviest losers. A conservative estimate places the loss of the others at $60,00, making the entire value of the property destroyed $150,000. 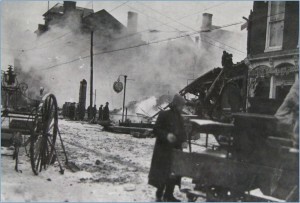 The blaze occurred in the heart of the town and the destructive work of the four hours’ fire this morning has changed that section from a block of brilliant stores attired in holiday dress to a blackened area of ruins, which will make the town poorer in many ways until this section is rebuilt. Several stores have arranged to resume business at once. Jeffries Bros., who saved all their stock will be open for business tomorrow morning in the vacant room next to the Palace Theatre. This firm had a huge iron safe in the fire, which was filled with valuable jewelry. It was forced opened after cooling off and everything was in perfect condition including the most delicate watches, which were keeping perfect time. The Frostburg Furniture Co. will probably occupy the Gladstone’s annex. The undertaking business portion of this firm will be carried on without interruption, their office being in the Gladstone Hotel until further notice.